I just can't get enough of Biscoff and Bourbon. This time I even added in some pecans to the mix. I did not hold back on the bourbon. I went for a full 1/4 cup. You could definitely smell the booze. The batter was still pretty thick, so I wasn't too concerned about the blondies baking properly. In fact, they baked beautifully. You could still smell the booze, but you could also smell the Biscoff and chocolate chips. I did attempt to cut the bars while they were still slightly warm, but it was difficult to do without them breaking apart. So before continuing, I placed them in the fridge for about 20 minutes, then I finished cutting them. That way I had much cleaner cuts. Now, you could eat them plain, just like this, or you can make them extra special. 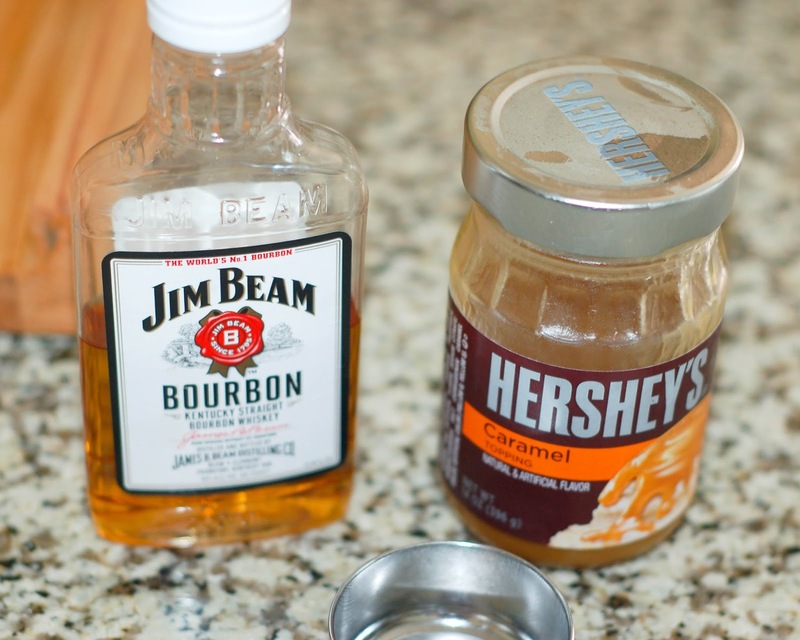 Grab a 1/4 cup of caramel topping and mix in a teaspoon of bourbon. Then warm up you slice of blondie in the microwave for 20-30 seconds. Top it with a scoop of vanilla ice cream and pour a little or a lot of Bourbon Caramel Sauce over the top. It's life changing, trust me. 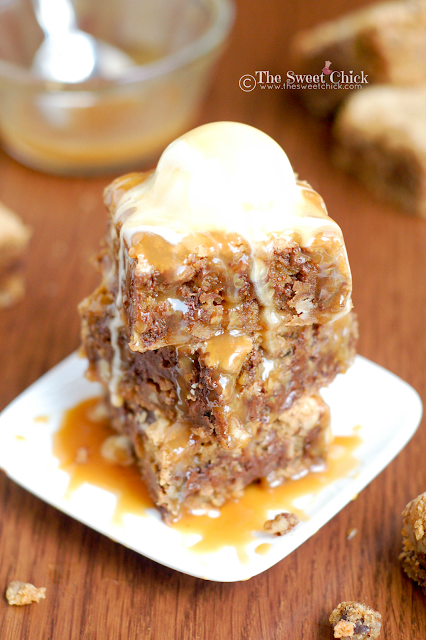 This ooey, gooey mess is good to the last drop. 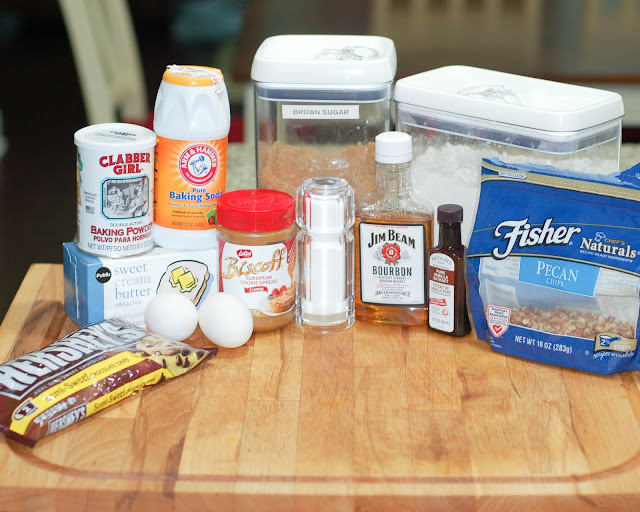 You can taste all the flavors, the bourbon, the biscoff, and the chocolate chips. Add to that the caramel and the crunch of pecans. It's flavor overload for the taste-buds. I was kind enough to share these with my neighbors. They rarely say no to my treats. I know my husband would like me to make some more for him on Father's Day. I think he deserves them! Line the bottom and sides of an 8 x 8 inch baking pan with aluminum foil. In a small bowl, mix together the cup of flour, baking powder, baking soda, and salt. 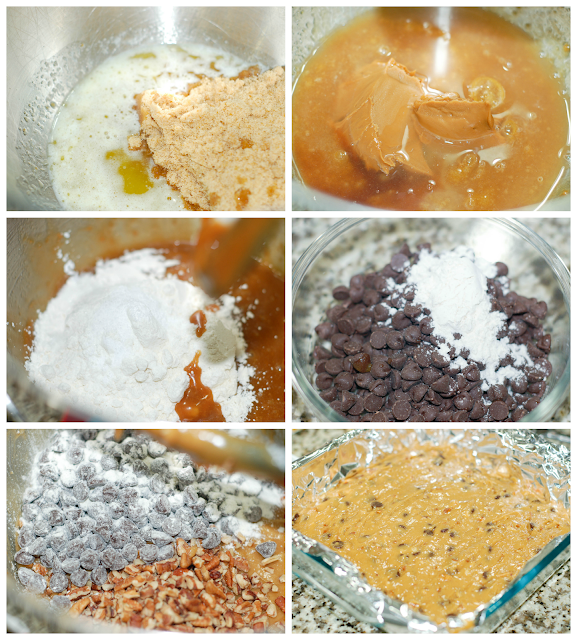 Place the melted butter and brown sugar in a stand mixer bowl and mix until combined. Then add in the egg, egg yolk, vanilla, bourbon and Biscoff. Mix on low speed until smooth. Slowly add the dry ingredients to the wet ingredients. The batter will be very thick. Do not over mix, or the blondies will turn out hard. Lastly, mix the remaining tablespoon of flour with the chocolate chips and add them to the mixer bowl along with the pecans. Mix until evenly distributed. Spoon the batter into the lined baking dish. Bake for 25-26 minutes or until a toothpick inserted in the center comes out almost clean. 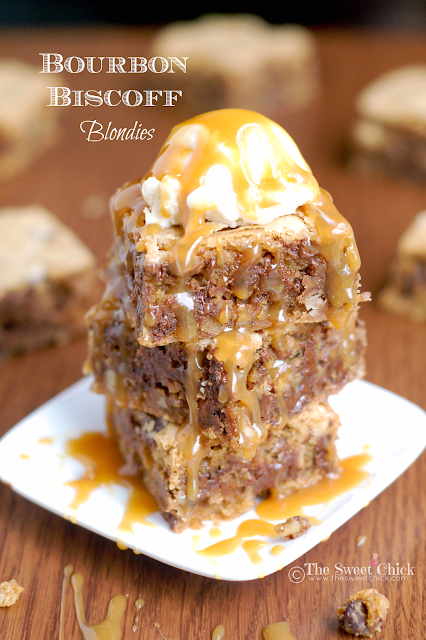 The blondies may appear soft, but they will set up as they cool. Allow the blondies to cool completely, about 3 hours. 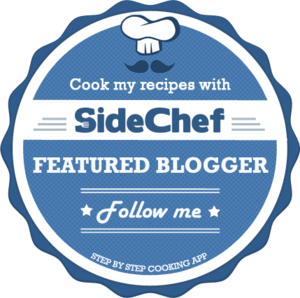 You can place them in the fridge for 20-30 minutes to speed up the process. 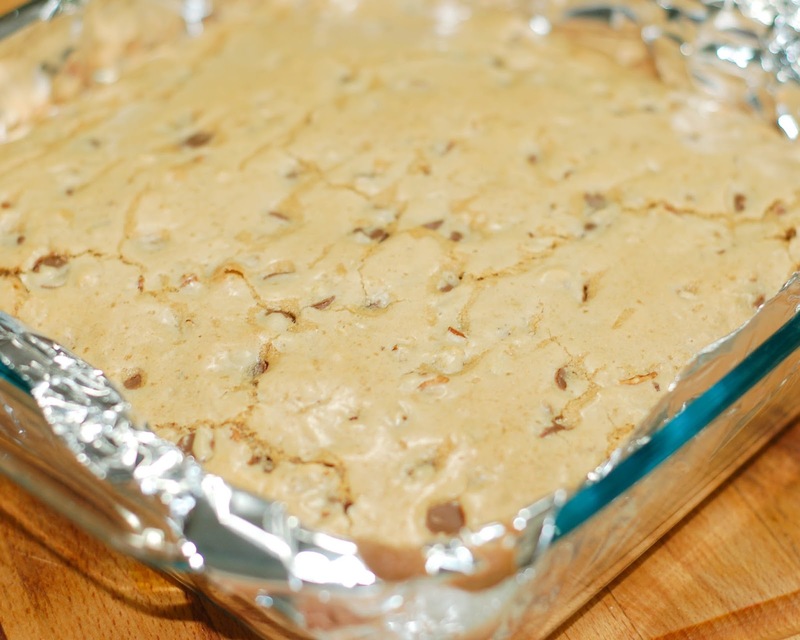 Once cooled, gently lift the foil out of the pan, place the blondies on a cutting board and cut into squares. In a small bowl, whisk together the caramel and the bourbon. 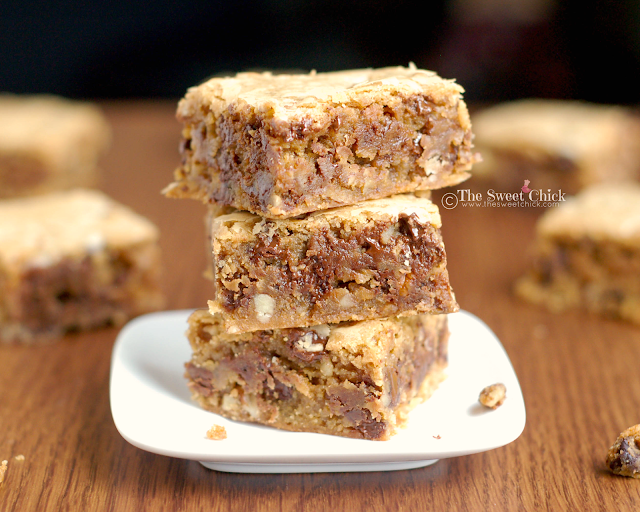 When ready to serve drizzle some over a blondie square. Vanilla ice cream is optional. 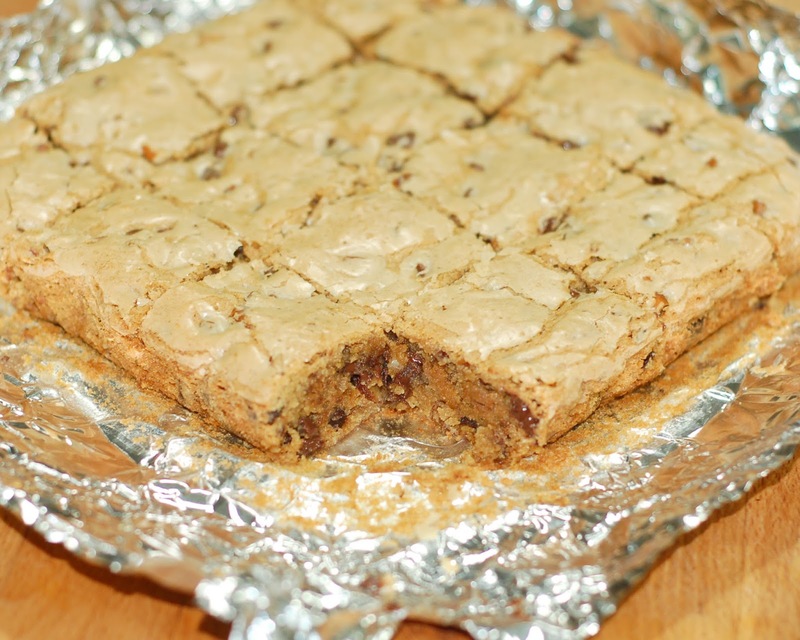 Blondies can be made ahead of time and stored in an airtight container at room temperature for about a week.